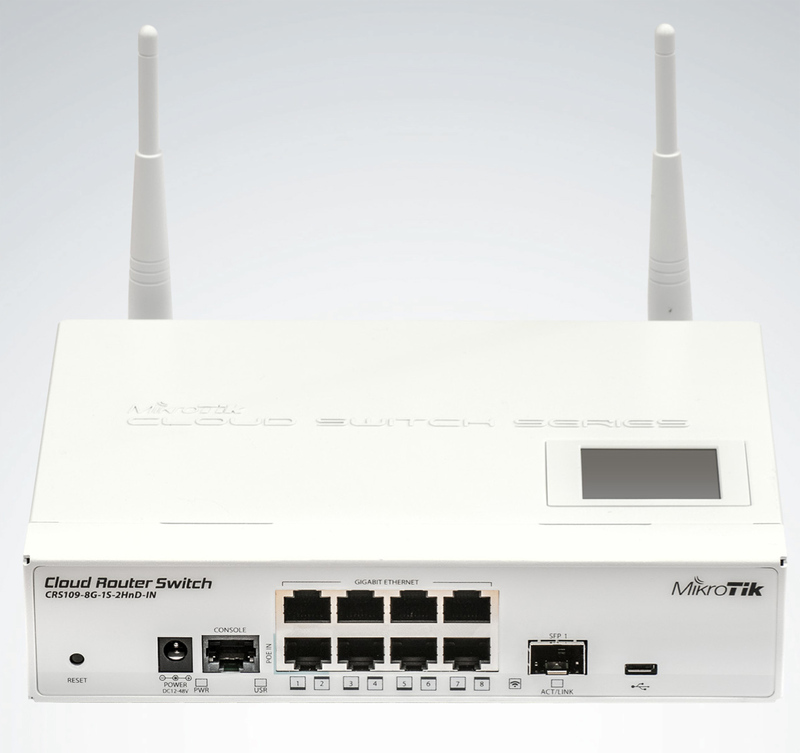 Home :: Mikrotik Switches :: Mikrotik Cloud Router Switch CRS109-8G-1S-2HnD-IN complete 1 SFP port plus 8 port 10/100/1000 layer 3 switch and router with onboard radio assembled with case and power supply - New! Mikrotik Cloud Router Switch CRS109-8G-1S-2HnD-IN complete 1 SFP port plus 8 port 10/100/1000 layer 3 switch and router with onboard radio assembled with case and power supply - New! What’s more - this device has a built in 2.4GHz wireless access point. This means you can have an AP, a router with any number of ports, and a full wire speed smart switch, all in one device - ideal for medium/small businesses and offices. It has 8 Gigabit ports, one SFP cage, a microUSB port and a built in Wireless AP. Mikrotik's CRS109-8G-1S-2HnD-IN supports any 1.25G SFP transceiver that is within the SFF Committee specifications for SFP Transceivers. CRS109-8G-1S doesn’t have hardware support for PON (Passive Optical Network) - this hardware support MUST be implemented on SFP transceiver itself. Note that the SFP transceiver is NOT included. Mikrotik Cloud Router Switch CRS328-4C-20S-4S+RM SFP switch, 20 SFP ports with 4 SFP+ cages and 4 combo ports in a 1U rack mount case - New! The Mikrotik Wireless Wire RBwAPG-60ad kit is a pair of 60GHz radios which provide gigabit speeds over a low cost wireless link - New! RB911G-5HPacD (US and Canada) Mikrotik RouterBOARD 911G with Atheros AR9557 720MHz CPU, 128MB DDR RAM, 5GHz 802.11ac dual chain radio, and RouterOS L3 - New! Mikrotik RJ45 SFP copper module 10/100/1000/2.5G/5G/10G with auto negotiation 24vdc 96 watt (4 amp) open frame switching power supply with Molex DC plug - replacement PSU for Mikrotik Cloud Core Routers Mikrotik RBSXTsq5HPnD (export version) is a low cost, high speed 5GHz wireless device. Dual polarization 802.11n and Nv2 TDMA technology help to achieve even 200Mbit real throughput speed - New!